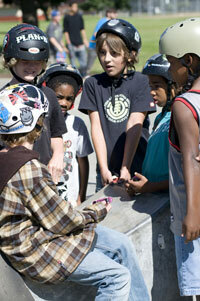 Kids are naturally curious and attracted to activities like skateboarding. When practiced safely and correctly, skateboarding can be the perfect vehicle to help kids develop and build on the essential physical and mental skills needed for success throughout their entire lives. In addition to these physical and mental skills, skateboarding programs can also help create opportunities for developing self-confidence as they provide teachable moments for positive interactions with others. Although many activities may prove to be a healthy influence on a child’s development, that activity will most likely have greater significance if the child has chosen it on their own. Of the many different influences a child will be exposed to, skateboarding proves to have some very unique qualities. First of all, skateboarding is intrinsically satisfying. Children are naturally going to gravitate to an activity that involves the freedom of rolling, turning, jumping and the different types of movements incorporated into the skateboarding experience. The different heights, speeds, and technical movements involved in the act of skateboarding provide a natural environment where a child can learn to solve problems, build self esteem, and overcome fears. 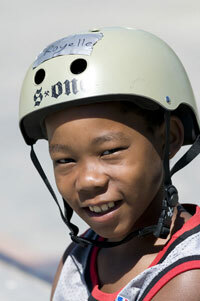 In addition to the physical and emotional benefits of skateboarding, there can be many other mental benefits as well. The complex movements involved in skateboarding can help to illustrate important physical concepts to a young skateboarder. Believe it or not, in skateboarding there are important rules that need to be learned and followed. Some of these rules are unvarying (physical laws with both real and immediate consequences if broken), and rules that relate to ones own safety as well as the safety of others. Because skateboarding is so attractive to developing children, and it is most commonly an activity that they have chosen on their own, lessons learned may be more effectively retained. Educators understand that a child’s success in school is heavily influenced by the early childhood experiences that help form and mold a child's self-concept. A developing child needs to have positively reinforcing experiences that illustrate to them how they can solve problems, attain goals, and have control over the direction their life will take. In reality, he concepts that are learned while achieving a skill in skateboarding are just as important as the skill itself. A young person who has experienced the success of reaching set goals, has developed a strong sense of confidence and self-esteem, and can also relate and interact positively with others, is undoubtebly going to approach future challenges and obstacles in life with increased chances for success. When utilized properly the act of skateboarding can literally be the vehicle to enhance a student’s adaptations to almost any challenge or experience they may encounter in life.